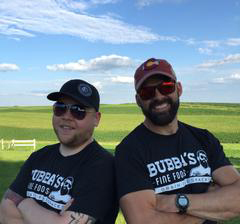 Bubba's Fine Foods originated in 2014 by Jared Menzel, Head Chef, and his brother-in-law, Jeff Schmidgall, Head Peddler. Every bag of this gourmet grain-free snack is artisan hand-crafted in small batches on the front range of the Colorado Rockies. Jared, nicknamed Bubba as a child, is a self-taught gourmet cook. He had recently started changing his diet to clean, high nutrient, and low glycemic foods. In order to make that happen, he replaced the processed foods that were pantry staples for most of his life. Being the connoisseur of fine foods that he is, Jared found a lot of the clean convenience foods on the market lacking in taste... and especially crunch. So he started experimenting and creating his own clean, real-food snacks in his kitchen. Jeff, a CrossFit Trainer and Health Coach, had recently transformed his health with a Paleo lifestyle. While their families vacationed together in the summer of 2014, Jeff fell head-over-heels in love with Jared's crunchy, grain-free snack mix. Selfishly hoping to simply buy the snack mix to satisfy his new-found addiction, Jeff encouraged Jared to start a business selling the amazing product... and bought a domain name for a future website right there at the breakfast table. Frustrated with your snacks? In need of a healthy option that doesn't compromise on taste? Enter Bubba's. With snack mixes that feature green bananas, mouthwatering spices, and real-food ingredients, you can snack all you want without all the guilt. Bubba’s Fine Foods is a mix of gear-grinding passion and purely intentional ingredients. No filter. No fodder. These mixes and chips are made of just real stuff with not a trace you can’t pronounce. “Natural flavoring” listings aren’t even messed with because at Bubba’s Fine Foods, they believe a person should know what they’re eating. All of the flavor and fill comes from real high octane food that grows on plants, trees or in the dirt. Kind of like it was before rockets and race cars. 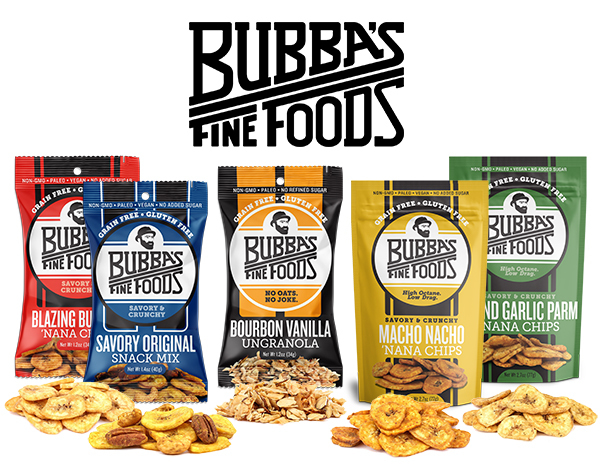 Bubba's Fine Foods has created grain and gluten free Snack mix, 'Nana Chips, and Ungranola, each available in a variety of mouthwatering sweet or savory flavors. These snacks are perfect for a paleo or gluten-free diet, but are enjoyed by anyone! 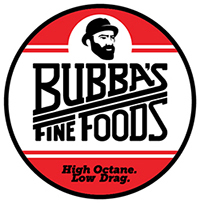 Looking for some different ways to use Bubba's Fine Foods? Check out some of Bubba's unique recipes here.